Who are the Street Specials MCC- a brief history? 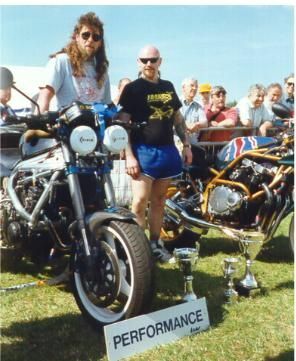 The SSMCC was formed when the Harris and Rickman owners clubs combined to form a general club for all builders and owners of Kit built and one off framed motorcycles. Formed in 1986 by Mick Foulds the Rickman owners club found an easy bed partner in the Harris owners club when it was re-formed in 1988 by Keith Fothergill (OK thats me!) both bikes being very similar apart from the frames themselves and owners of these kit built motorcycles shared the same need for engineering skills and one off parts! The two clubs had their first rally at the Newhaven Hotel only a couple of miles from the Bull in the thorn where the SSMCC have held the specials rally recently. The joint rally worked quite well, despite the diabolical weather that seems to be permanent in that part of the world and after a visit to the Specials rally in Belgium that same year it was decided to expand the rally to include all Specials, hence the first Specials rally in 1989. As time went on the financial drain of running two national clubs for such rare machines was just too much and so when Mick Foulds decided to retire from running the Rickman club the clubs were combined to form the SSMCC. Later on the Moto Martin and Featherbed Specials club joined the fold and the rest is history. The club now has a well organized committee which was formed when Keith Fothergill retired as Chairman in 1998 at the 10th anniversary specials rally. Thanks must go to Kyle Rushby (the Long haired thuggy type above) for keeping the club going and forming the Committee. Kyle has now stood down and we have a new chairman, Eamon Dorrian, who ironically ran a Harris owners club in the early 80's that was forced to fold for the same reason the second club got together with the Rickman club! The clubs members can be seen putting on displays at many shows up and down the country, including the streetfighters show in April, The BMF rally in May, the Motorcycle world show at Beaulieu in June, Specials rally in July the Tail end in September and the Motorcycle mechanics show in October. These shows usually have freetickets for all those displaying bikes!!! IF YOU OWN OR ARE THINKING OF BUILDING A SPECIAL THEN THIS IS THE OWNERS CLUB YOU HAVE BEEN LOOKING FOR!!! 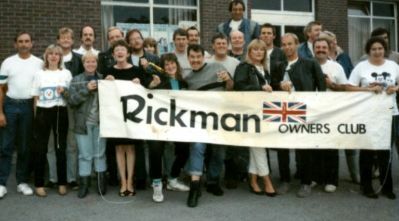 Members of the Rickman OC at the Specials rally in Belgium many years ago! !- IF ONLY THEY NEW WHAT THEY HAD STARTED! !